Perennial. Culms 40-60 cm long. Ligule a fringe of hairs. Spikelets comprising 6-12 fertile florets; with diminished florets at the apex. Spikelets oblong; laterally compressed; 15-30 mm long; breaking up at maturity; disarticulating below each fertile floret. Floret callus evident; pilose. 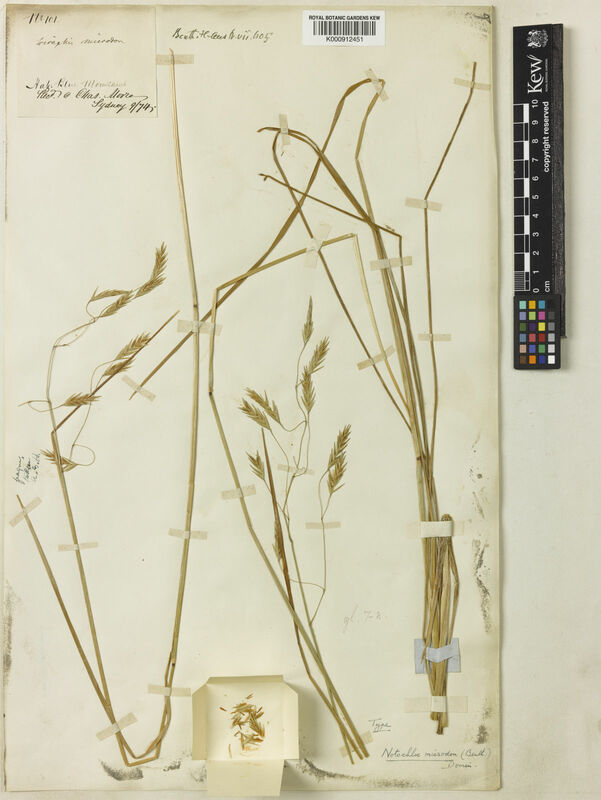 Glumes persistent; shorter than spikelet; thinner than fertile lemma. Lower glume lanceolate; 0.8 length of upper glume; membranous; 1-keeled; 3 -veined. Lower glume apex acuminate. Upper glume lanceolate; 0.5-1 length of adjacent fertile lemma; membranous; 1-keeled; 3-5 -veined. Upper glume apex acuminate. Fertile lemma elliptic; keeled; 7 -veined. Lemma lateral veins ribbed. Lemma apex dentate; 3 -fid; incised 0.15 of lemma length. Palea 2 -veined. Palea keels ciliolate. Apical sterile florets resembling fertile though underdeveloped.